What’s the bravest thing you’ve ever done? It may be something physical like jumping out of a plane or running a marathon or speaking in front of a crowd. It might be something more intimate like telling the truth in a tender situation or telling the doctor that’s not the treatment you want or saying gently but firmly that enough is enough. Whatever it is, think of the bravest thing you’ve ever done and recall the sensation. What did it feel like in your body? What emotions did you feel? What thoughts ran through your head? Brave feels both scary and exciting. There is often push/pull sensation of “Yes, I really want to do this” and “Holy Crap, what if I do?” Making the brave choice by its very nature means that you are allowing yourself to be vulnerable. Brené Brown’s ground-breaking TED Talk, The Power of Vulnerability (2010) explains that connection is essential to the human experience. Connection is why we’re here and it is what gives our lives purpose and meaning. Her research demonstrates that in order to truly connect with others, we be vulnerable. Vulnerability is absolutely not weakness (a common misconception) but means that we allow ourselves to be seen, to love without guarantee, to risk failure, and to believe we are enough. For most of my life, vulnerability scared the bejeezus out of me. Sometimes it still does. Shame, I get. Since adolescence, I have been ashamed of my body. I thought it wasn’t thin or beautiful enough for me to be worthy of love and connection. My body felt like a character flaw and I was sure something was seriously wrong with me. I’ve done a number of brave things in my life: marrying a man with two young children, teaching Nia, taking a sabbatical from teaching Nia, sharing my writing, walking all the way to the top of a fire tower. But when it comes to my relationship with my body, the bravest thing I’ve done is to relax. At the height of my disordered body relationship, I was doing whatever I could to tighten up. Aerobic exercise, weight lifting, obsessive food monitoring — all of my energy was poured into having nothing soft or flabby or pooching out or sagging. I was always, ALWAYS walking around sucking in my stomach. I believed that if I was thin enough and lean enough and tight enough that I would be confident, safe from criticism, that I would be loved, that I would be happy and whole. I thought that if I looked just right, no one (including me) would judge me. I would be invulnerable. I wanted to be thin so I wouldn’t be vulnerable … so I wouldn’t have to be brave. Of course, this totally didn’t work. Having my internal experience (feeling love and belonging) be dependent on an external circumstance (my physical appearance) will never work. I kept thinking that the reason I didn’t feel confident and relaxed in myself was because I wasn’t perfect enough and that if I just worked a little harder, I would be. On a good day, this circular logic makes me laugh; on a bad day, it can have me twisted up and tripping over myself. Even when I lost weight, got leaner, and sucked in my tummy all the time, I didn’t feel any more worthy or connected or loved. I thought perfection was the way to those feelings but it’s actually the path away from them. Real love and connection requires that we be seen with all our imperfect softness showing. 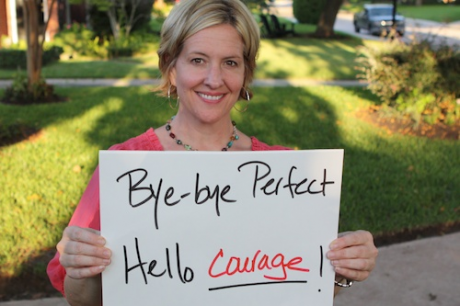 Brené Brown calls it whole-heartedness. I am living whole-heartedly when I am willing to be vulnerable and when I believe I am worthy of love and belonging. Whole-heartedness means taking emotional risks, telling the truth with no guarantees. It means not sucking in my stomach and relaxing into being my brilliant, messy, beautiful, spazzy self. What’s the bravest thing you’ve done today? How about making the courageous choice to be imperfect? Be kind to yourself first, then to others. Let go of who you think you should be so you can be who you are. Take a breath, relax your belly. Brave feels both exciting and scary. When you feel it, you’re on the right track. Completely on the mark. Now that I am older and look back at my thin days, I know I was not happier. Life experiences, like living bravely, help,us to truly know what really matters in life: giving and receiving praise and consideration, forgiving and loving, laughing and dancing! In these moments of joy and grace, we find happiness. Wow, Elisabeth, I couldn’t have said it better. Here’s to the scary exciting brave experiences! Thank you!